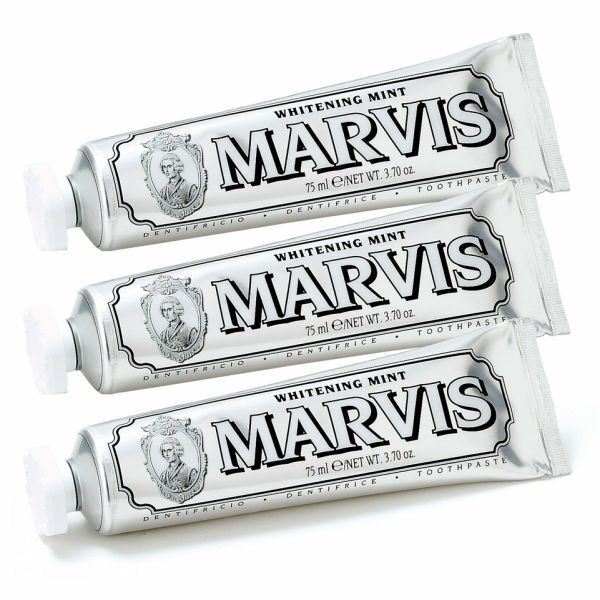 The Marvis Whitening Mint Toothpaste Triple Pack is a great value buy. This whitening toothpaste can help you to keep cleaner teeth and prevent discolouration by removing stains and protecting against all those things that we consume that cause a problem for our teeth. This Marvis toothpaste contains fluoride so that you have protection against tooth decay, but this whitening toothpaste is also able to offer protection against plaque and tartar and ensure that your breath is fresh. The toothpaste tube design is elegant with a vintage style, and is a great addition to any bathroom. Buying in bulk means you never run short. 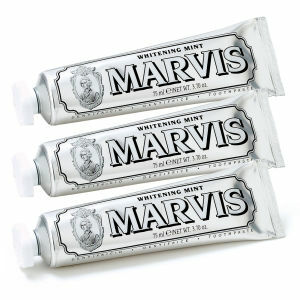 I heard of that Marvis is called the Hermes in all kinds of toothpastes. So I bought 2 packs at a discount with free shipping this time.Bubble is a little bit less comparing with the toothpaste I used before，but really much cleaner and fresher. Fast delivery and very sucure packaging. Really enjoy this bought from Mankind. Definitely recommend!!! This toothpaste is slightly pricey but 100% worth it. I was in doubt at first, but after the first use my doubts were put to ease. I won't go back to using any other toothpaste. What a wonderful brushing experience with Marvis ! strong mint flavor and feel very refreshed after use . Definitely it is a good item to recommend to your friends. Well, it's better if can packaging strong some more. I have received the package four days ago. It took bout 13-14 days to arrive to China...Honestly, I thought that the price was a little bit too dear for me... But after using it for a first time, the flesh flavour and the whitening function make it totally worth the price!! Strongly recommended to everybody!! With the long waitting, finally,I have received them! I can't believe my eyes! After that, I fall in love with brushing my teeth. I like laughing,cause my teeth are shining. It's my first to buy things from this website, I think it's very good. Looks extremely stylish and works good as a toothpaste as well. The shippment was not so good as before. It takes a long time (about 22 days) to get my package after I placed my order. this is my first to try , it's an amazing exclent toothpaste! enjoy the life enjoy the mavis! so good. The price is cheaper than others. Very good. Is the best I've used toothpaste. Introduced a lot of friends, they are very satisfied.Hope more people can use to it. I like the smell, it cleans my teeth thoroughly. I think I will buy it again. It was a good product! I like it, and will continue to use it!